In which our intrepid wanderer arrives at Grassington only to find a closed museum, buys a sandwich the size of a small country, gets a bit wet, realises he’s ridiculously early so goes up a hill for no apparent reason, gets wetter and finally arrives in Kettlewell to get stared at by scarecrows. Walking by ones self is usually a rather different experience to walking with others. For start you tend to feel rather self conscious sat on your tod in the pub in the evening, and as there’s no one around to talk about mad Aunt Mabel, the impulse is to start talking to ones self. Personally I always seem to end up singing although it’s rarely a full song. The song snippet, usually a chorus, will end up being repeated ad-infinitum and the selected tunes themselves can often be, shall we say, a little random? Take the three going round my head during my second days walk for example. First there was the opening song to the musical Les Misérables, whose chorus of “Head down, head down” did at least turn out to be vaguely appropriate at certain parts of the day. Second on the perpetual loop was Peter and Gordon’s single, World Without Love, which begins with “Please lock me away, and don’t allow the day, here inside, where I hide, with my loneliness”. From 1964 it was a song my parents owned as part of a “hits of the 60s” set of cassette tapes which usually got played as we headed off on family holidays as it was about the only music everyone could agree on. And then third was the seminal classic “Bye bye blackbird”. Apparently sugar is sweet and so is she. To add to that was song four – a song I made up in an attempt not to startle some sheep, however the least said about that one the better… Still with a song in your heart and a spring in you step, you can do anything! 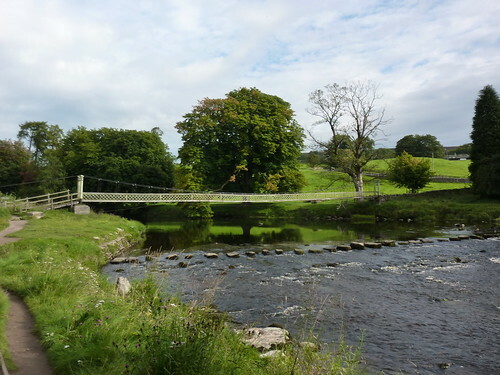 The day started easily enough by rejoining the River Wharfe once more as it ambled gently on its way to the Dales town of Grassington. My guidebook proclaimed the path could be insanely busy however at 9am it was mostly me and the ducks which made a welcome change after the crowds from the day before. 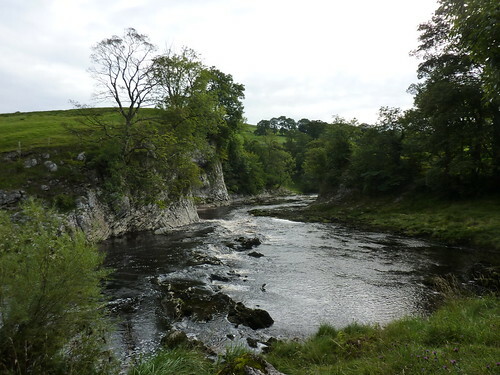 Almost immediately I passed the cliffs and rocks of Loup Scar where, in 1766, an attempt was made to dispose of the body of one Doctor Petty who had been murdered for the audacity of telling Grassington resident and violent drunk Tom Lee, to mend his wicked ways. For his nerve, Lee sprung upon the good Doctor and beat him to the ground near Grass Wood. Lee was later caught and taken to trial however managed to escape conviction twice. He was finally sent to the hangman after drunkenly boasting about the crime to his apprentice. Such tales of evil didn’t detract from the beauty of the place too much thankfully, which was good as it was a pleasant morning to amble along the river as I strolled up to Hebden Suspension Bridge. Just in front of the bridge lay a well worn set of stepping stones which the bridge eventually replaced in 1885. Looking at the bridge, a part of me thought I’d be better off on the stones even if they were widely spaced. It’s not as if the bridge was unsound or anything. It was just incredibly narrow and even without having a heavy rucksack on, I would have struggled to fit on the thing. Now I’m not exactly wide, however it was obviously built with a slightly smaller frame in mind and with my rucksack on it became an interesting challenge which I half expected the water bottles to come flying out of the side pockets of my rucksack and splash in to the river below before floating off in to the distance. Oh and the bridge wobbled. Oh how it wobbled! And for that matter, creaked! By the time I’d made it half way across I was getting new images of the bridge catapulting me off in to the water along with the water bottles! The sides of the bridge were, at one point, barely knee high and if I’d tripped, well let’s just say it would have been fun and I was thankful not to find out how shallow the water was. Crossing the river did at least have its benefits (as well as being compulsory – there was no footpath on the other side) and the Dales Way to Grassington was now lined with a splendid row of trees, whilst ducks quacked and rabbits did whatever that thing is that rabbits do. Eventually Linton Church came in to view and I realised that in barely 90 minutes I’d done almost a third of my walking for the day. Linton Church is a curious church. A long, squat building, its dominant feature is the lack of something, namely a tower. There’s a small tower-ette kind of feature with a clock in it but it’s barely taller than the main roof. 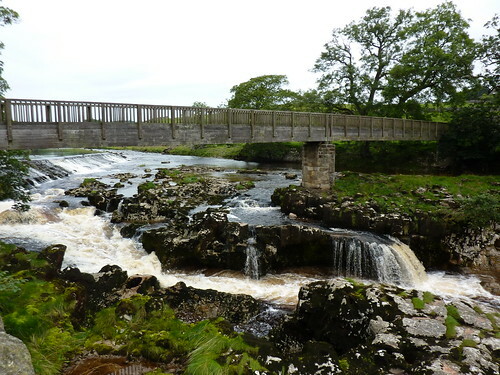 Apparently it was also an interesting place to visit, however it was also stuck on the other side of the River Wharfe at the end of a very long line of stepping stones. Tempting as it was to use them, there were several wide gaps between stones and more than a few that seemed to be unnervingly sloped, so I made do by following the less direct but far safer access route by heading a quarter of a mile down the Dales Way and crossing over using the far safer bridge at Linton Falls, before heading back down the other side of the river to the church. A bit of faff and no mistake however ultimately worth it – the inside of the church was lovely and I spent a fair amount of time soaking in its tranquillity. 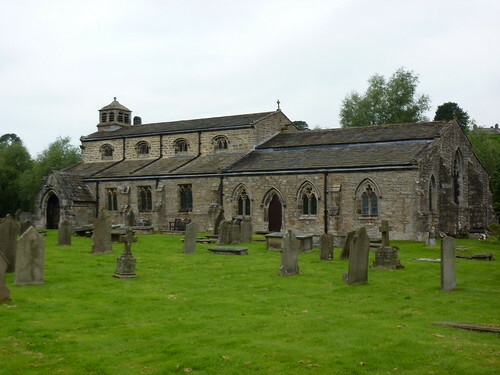 As well as having no tower, Linton Church was also once associated with two different abbeys, the result of which was that for most of its operational life it had two different pastors and two sets of church wardens, which would take it in turns to run the church. Whether they preached two different messages is not recorded. Such confusing affairs were the result of Norman landowners giving land in the area to both Coverham and Fountains Abbey, and the situation continued for several hundred years until the death of one of the pastors finally saw the church united, although it retains four church wardens in deference to its past. All of which I can tell you thanks to the church thoughtfully erecting a small but well presented history display in a corner of the church. I can also tell you than on my visit, an agitated swallow was flying around inside which seemed to have got stuck and couldn’t get out. There wasn’t a display about that for some reason and the bird failed to take my hint of leaving the door open, so I left it in the capable hands of a member of the church prayer group who was sat quietly praying for people and I was sure was the kind of person to offer up a silent prayer to him up on high so that said bird would see the error of its ways and find the mighty escape route it was looking for. Back at Linton Falls I re-crossed the bridge and admired the spectacle of what my guide book described as “the Wharfe arguing with the North Craven Fault”, where the river crashes noisily over several large limestone rocks before sailing on down the river. It would be the last I’d see of the river for a while and I bade it a fond farewell as I took the gentle stroll up hill to the village of Grassington, undisputed capital of Upper Wharfedale. Full of stone buildings, its small town square was bustling with shoppers and tourists and I made the most of the opportunity to buy some lunch to eat later. Ordering a prawn sandwich from a bakery I opted to pay the extra 40p to “go crusty”, the result of which was that I was promptly delivered what most people would describe as “half a baguette”. In case that wasn’t enough, I purchased the largest Bakewell tart I’ve seen in my life. Mere moments after leaving the bakery the inevitable happened and it began raining, and it was with even less surprise that I found that Grassington’s folk museum was closed on Mondays meaning there was nowhere to shelter and little to delay me further. Into the rain it had to be, and I headed up towards Grassington Moor. The rain continued, albeit lightly, but it was enough for me to head to the nearest tree to shelter whilst I had an early lunch. 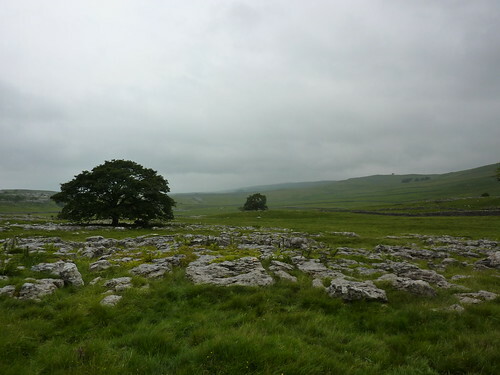 The tree, a loner on this moor, sat in the middle of a limestone pavement whose rocky gaps had become home to many a fallen leaf and the odd sweet wrapper. Of course trees only provide so much shelter from the rain and as it came down harder, the leaves struggled to protect me. Large sploshes began to hit my waterproofs and eventually it was wetter underneath the tree than outside. After scoffing my cherry Bakewell and waiting for an army of soggy looking fell runners pass by, I packed up once more and headed on my way. Passing by more limestone and even more grass, I came to Conistone Dib, a huge dry gorge between two hills, looking vaguely eerie in the cloudy gloom. Nearby was the impressive Conistone Pie, a small hill with an almost crown like rock topping and which just called to be climbed up, and from which I was presented with some fine views of the valleys below. The sun could be seen shining down on them below, and up above with the cloud clinging on to the hills, I felt a twinge of jealousy. Still at least the rain had stopped and I headed towards Highgate Leys Lane which would take me to the village of Kettlewell, a mile and a half away and where I was booked in to stay. There was just one problem. I was hopelessly early. It had barely gone 2pm and I’d almost finished for the day. In despair I looked at my map and spotted that I could take Highgate Leys in the other direction. This would take me further in to the moors where I could do a tiny loop, admire the sights and waste some time before heading back down again. A fine plan and no mistake and I optimistically marched up the steep path and congratulated myself on my cunning and ingenuity. Even better it was so dry that I could now take my waterproof trousers off. Result! Sitting down on a rock I rested and began the unzipping process that would be required to get my waterproofs off, only to find that barely had I managed to struggle out of them, the rain had begun once more and I had to put them back on. Undeterred I kept on the path and got far enough up to see my destination: a high ridge of moorland with no distinguishing mark or feature bar a few rocks near the top. Unfortunately it was also covered in dense, grey cloud. With little hope of getting a good view up there, and the definite promise of getting soaked by the contents of the clouds, I sighed, abandoned my endeavours and accepted the inevitable. I’d just have to arrive in Kettlewell several hours early. When one of the first things you see in a village is a large dummy dressed in bathing gear and scuba diving goggles, then you can’t help but wonder about a place. It made no sense at all to me, but as I passed on down in to the village more and more curious sights did I see. A life size Lewis Hamilton with racing car; a woman lying on her back balancing bathroom scales on her feet… Even Paddington Bear strapped to a fence post. Eventually I found a sign which explained all. I wasn’t a renegade secret agent after all. 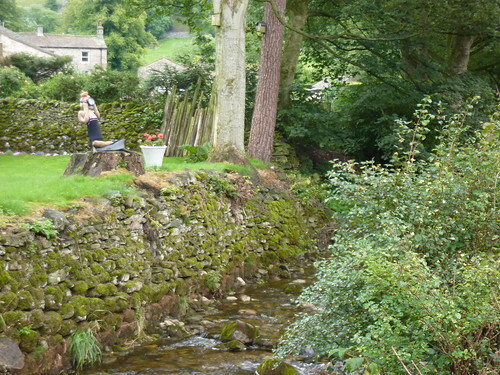 In fact I’d arrived at the end of Kettlewell’s annual scarecrow festival. Indeed if I’d been there the day before I could have popped in to the local church to see two scarecrows get married. All around Kettlewell scarecrows hid in corners, in front gardens and in even more curious locations. Each had a different theme, from Japanese tea ceremonies through to an angler standing in a stream. I spent a happy half hour or so wandering around the village’s myriad of streets admiring them all and the effort that had gone in to them. Kettlewell was a curious village with no real centre; shops, pubs and amenities seemed to be rather haphazardly placed. One street would house the inevitable outdoor clothing shop; another the site for a cafe. It was all rather wonderfully random, even more so when I turned a corner to find out that the local post office was based in the youth hostel reception! The hostel was where I was staying and whilst I’d delayed myself as much as possible, I was still an hour early for check-in. With little to do I took my pick of the village’s three pubs. Each one seemed to specialise in a different brewery leaving me of the dilemma of choosing between Black Sheep, Timothy Taylor or Copper Dragon brews. 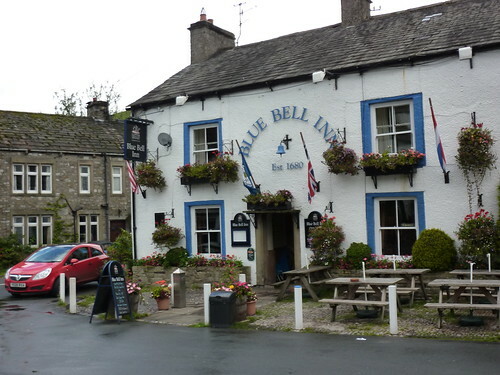 I opted for The Bluebell Inn and its Copper Dragon selection, persuaded more by the sign outside proclaiming it had the friendliest welcome in the village, and I spent an idle hour sat by a fire supping a pint of Black Gold and perusing maps in a near empty bar whilst the barman polished glasses and restocked the fridge. My pint taking me nicely up to 5pm I headed to the hostel just as it switched in to hostel mode where I spent the evening enjoying several more bottles of Copper Dragon’s beers and being bemused by a Dutch family and their curious way of eating a meal. To call it eclectic, is perhaps an understatement. The first course consisted of chocolate Swiss roll and biscuits, which was followed by baguette and soft cheese. After a while a third course of tomato soup arrived with yet more bread. Finally a fourth course of chocolate mousse finished the meal which was eaten entirely on disposable plates and whilst watching several Herbie films on a distinctly non-disposable portable DVD player. Still the soup did smell good, even if it was just made by Heinz and out of a tin and a least all they had to wash up was a saucepan. It had been many years since I’d watched a Herbie film. For some reason an afternoon showing on BBC One of Herbie Goes To Monte Carlo proved far more preferable than revising for my final year exams at university; however besides that my Herbie education was rather lacking. Until now anyway. Re-positioning my chair and with another bottle of beer in front of me, I settled down for a nights viewing. First Published: 10 January 2011. Last Updated: 24 December 2018.